ProAiir Hybrid Makeup is a combination of the essential ingredients of cosmetic grade alcohol (as used in liquid eye liner) and the highest quality pigments available to create the perfect hybrid airbrush makeup product. Unlike other hybrid makeup, ProAiir contains no water and blends together a complete set of water repellant makeup ingredients. ProAiir sets the standard for hybrid makeup today and tomorrow with the most durable, longest lasting, non-staining, most water repellant makeup formula on the market. The absence of water in our formula means you'll experience little or no separation of pigments from fluids, leaving you time to service more customers instead of wasting time stirring or shaking bottles. 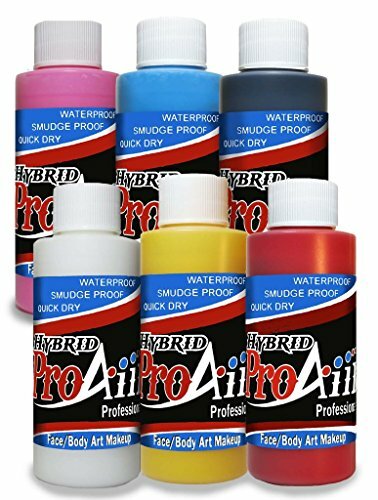 ProAiir works well with both airbrush and traditional brush painting with unbeatable durability. Unlike other airbrush products, ProAiir sprays without lingering clouds of fog. By following the simple application instructions, ProAiir will outperform and outlast all hybrid products for application and durability. Not only will your designs look better and last longer, you will have happy customers from the time the design is complete until they are ready to remove it. Ease of application, durability and simple removal. What more could an artist ask for in a hybrid makeup? When you need the most durable, longest lasting face and body makeup, choose ProAiir from ShowOffs!